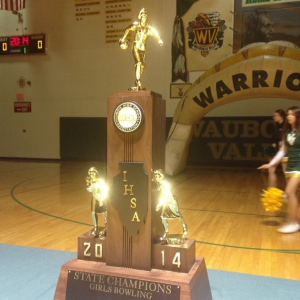 Waubonsie Valley held a recognition ceremony on Monday to celebrate the accomplishments of some winter sports, specifically the IHSA championship brought home by girls bowling. Student-athletes were individually announced to the applause of the student body, who were in attendance. “It’s pretty exciting and it’s awesome being a part of school history,” said senior and individual champion Julia Bond. “To have this assembly and to have the kind of support that only Waubonsie has is incredible.” Bond averaged a 234 per game in the weekend’s two-day championship. It’s the first time that a school has won back-to-back state titles since 2002. Overall, it is the fifth state title for Waubonsie Valley High School.